Entertainment@Amphenol is excited to announce the release of our NEW HPT Series Power Connectors and Accessories, an extension of our highly successful HP Series (Blue/Grey) Power Connector line launched last year at NAMM. Like our HP Series, our NEW HPT Series brings significant design improvements to the marketplace and at lower prices than other manufacturer’s products in this space! 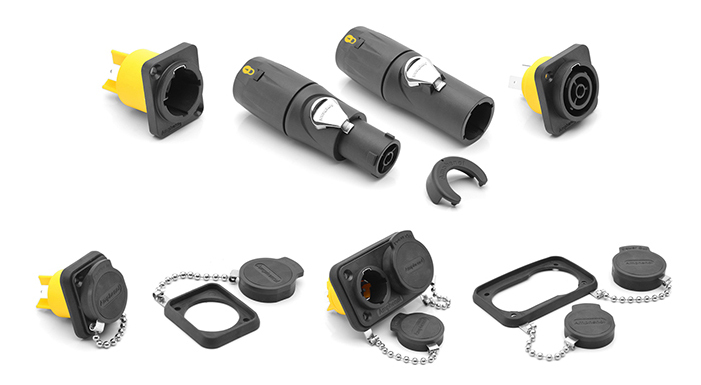 Designed to be fully plug compatible with existing industry standard products and UL Recognized to be so, and with an innovative patent-pending cable clamp lock design safety feature, the HPT Series is an ideal “first choice”, or “drop in” replacement, for your lighting fixture, video wall or power distribution interconnect needs. HPT Series connectors are suitable for AC power supply where a durable, latched, twist-locking connector is required. They are rated at 16A@ 250 Vac. HPT Series connectors can be connected or disconnected under load and are IP65 rated. The latest front-end safety keying features are already incorporated into our designs, eliminating the personnel and equipment safety risks of mis-mating associated with worn out master keys, which has occurred with other notable manufacturer’s products! Unlike our competitor’s one-piece molded closure cap design, where the hinge is easily torn off from its sealing gasket in real-world applications, our robust design allows easy replacement by simply unscrewing a single mounting screw from the panel mount connector, slipping our bead chain lanyard under the panel mount screw hole, then reassembling the screw. This is a significant labor savings and will allow easy field replacement, no matter the location!